This is by far one of the most unusual looking sheds in the Windsor collection. The curved roof isn’t found on many buildings which truly makes the Aero shed one of a kind. It is similar to a pent roof, only it has the curved overhang at the front of the building. This maximises its water resistance as well as giving it a striking design. One thing you will notice about this shed is that it has a very deep, but not a very wide design. This means it can fit into narrow spaces. It is built from strong premium Shiplap tongue and groove and even the floor and roof are constructed with tongue and groove too. There are two large styrene glazed windows situated on either side of the building. This again is another unusual design as shed windows are typically located next to one another. This means you get light entering the shed from both sides. The single door is braced and has a strong pad bolt fixed onto it. This means you can padlock it provided you buy one. All fixtures and instructions required for self-assembly are included and we love that the timber has been dip treated prior to being shipped. The unpainted design might not be to everyone’s taste. You can easily alter this with coloured treatments however. 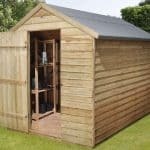 The Windsor AERO Curved Roof storage shed has one of the most modern, attractive designs of any other shed on the market. Its eye-catching style makes it really stand out and will complement any garden. It has a very narrow build, though as you can see it benefits from an impressive height. Considering it isn’t very wide, the single door has an outstanding wide construction, enabling you to store all of your tools, equipment and small machinery with ease. What it seemingly lacks in width, it makes up for in depth. The shed offers a deceptively spacious interior capable of storing quite a lot of equipment. It’s great to see the outstanding quality of the exterior has been extended to the interior of this shed. Tongue and groove is used throughout, including the roof and the floor. 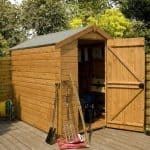 This is a great benefit as the majority of sheds, even with this price tag, tend to come with solid sheet materials. 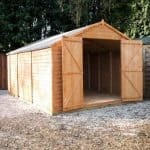 The thicker construction means the building is both sturdier and a lot more durable than a lot of other sheds. Of course, it isn’t just this high quality construction that makes the shed stand out. The roof itself is an unusual and visually striking focal point. For the most part it looks and functions just like a pent roof, only it has an exclusive curved overhang. Tongue and groove Shiplap cladding is used to create a sturdy, solid and reliable structure. There are several cladding types available and this is by far the most superior. It doesn’t just look a lot better than overlap, but it also functions better against the elements too. For example, Shiplap has a channel situated between the panels which quickly drains water away from the building. The tongue and groove aspect of the cladding also forms a strong, sturdy interlocking fit which prevents drafts, as well as keeping rainwater out of the shed. A 28mm x 28mm frame is used inside the walls to provide a strong, stable support. Though an excellent dip treatment has been applied to the timber, it does still require annual treatments. 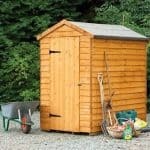 Shed Store do give a free tub of treatment however so this saves money on the first years treatment. A strong braced single door is situated on the front of the shed. Opening out to reveal a large entry space, you can fit wider tools and equipment easily into the shed. However, at 4’3” tall, there certainly isn’t enough height to walk into the building. The good news is that once inside the shed there is plenty of head space. On either side of the shed there are large, tall fixed styrene glazed windows. They may not provide any ventilation into the building but they do let in a lot of light. The very strong cladding does supply a good level of security, but to stop thieves getting into the shed, you will need a padlock. Shed Store do have excellent alarm padlocks available, but you will need to browse the site to find them. There isn’t any privacy due to the large windows, but you could hang curtains to solve this. Overall we are disappointed with the initial level of security included, but it isn’t expensive or difficult to fix. 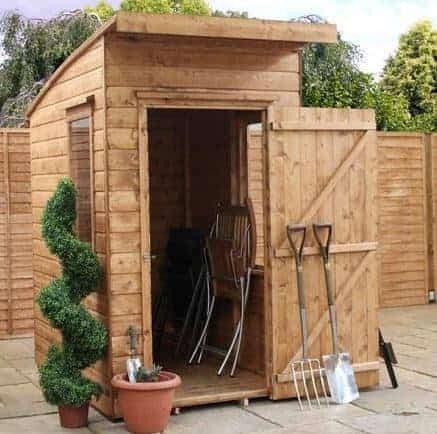 There aren’t too many extra choices available with this shed but that’s technically a good thing. After all, it means you don’t have to spend much more money on upgrades. However, we do feel Shed Store could have offered more useful extras as the ones on offer here aren’t really essential. Take the Garden Building Installation Service for example. Yes it will save you stress and time trying to assemble the building yourself. However, it isn’t a cheap service and the shed isn’t actually that big. So technically it isn’t going to be overly difficult to assemble yourself. Then there’s the DIY Assembly Assistance Tool Kit. Now if you don’t have many DIY tools this could be a good investment. Considering how many high quality tools it includes, it comes at a very low price. However, if you’re a DIY enthusiast it’s likely you already have the tools included in the kit. The one option you may find useful is the coloured DIY treatments. With four different colours, you can quickly and easily customise the style of the shed. As the manufacturer has dip treated the timber, another treatment doesn’t need to be applied quickly after construction. However, it can’t hurt to treat it again and if you’re wanting a different colour these treatments are definitely worth investing in. This unique storage shed is built with exceptional quality materials. You can always tell a shed’s quality by looking at the materials used on the inside. Shed Store haven’t cut costs with the interior of this building, making full use of tongue and groove for both the roof and the floor. 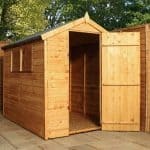 As the shed is made from high quality materials, it is guaranteed to last for a long time. You do need to apply annual treatments, but the dip treatment applied at the factory gives it an additional level of protection throughout the first year after assembly. This is a fairly small shed so it isn’t going to leave you with bundles of space. However, it will comfortably fit all of your outdoor essentials and should be suitable for most households. The Shed Store doesn’t give any indication of how long it will roughly take to assemble this shed. However, taking into account the size of the building and its features, it will likely take around 2-4 hours. Despite its unique look, it shouldn’t be too difficult to put together, though it is recommended that two people work together to assemble it. Overall you do benefit from excellent value for money, but there are a few things you will want to upgrade. The fact it also requires annual treatments has factored into the rating. However, considering its unique design and high quality build, it is definitely worth its price tag. 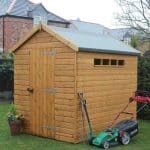 Final Thoughts: Great for narrow, small gardens, the sensational AERO curved roof storage shed is one of the more unusual and striking buildings available. Benefitting from a strong weatherproof design, we like that both its interior and exterior are created with tough tongue and groove cladding. This makes it suitable for equipment and tools of any weight and it also has a natural long-lasting design. Even the door has been well-braced and the pad bolt included has a tough build. Whilst the two styrene windows located on each side of the shed limit privacy, this can be solved if you install blinds.